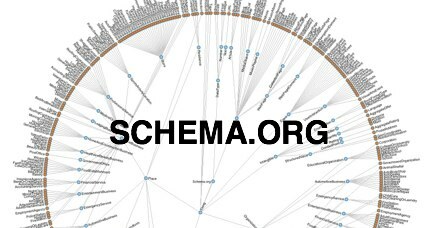 The concept of Schema.org has been on the SEO radar for more than three years. Although it is one of the most powerful forms of optimization, it is also the least-utilized. According to statistics, less than 0.3% of internet marketers and website owners use it on their pages. Effective e-Commerce schemas from the GoodRelations project have been integrated in Schema.org. This is great news for retailers, as it can vastly increase the click-through-rates for their sites. What Schema.org does is provide with additional information within the search engine snippet. 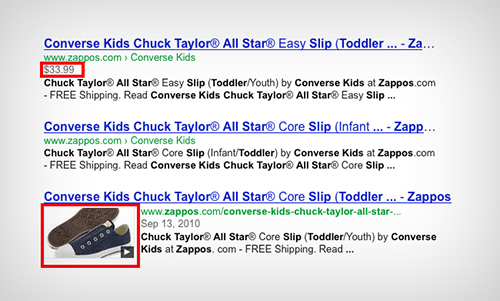 This will make it easier for visitors to decide whether or not they want to click on your result in SERPs. This granular information provided for products and offers is offered to search engines in exactly the form that they want it. Sadly, even if the positive results are obvious, very few websites are using this markup (which means that many other are missing out on incredible SEO potential). But before we talk about how Schema.org can be implemented on your eCommerce website, and how it will help it, let’s get a better idea of what it is. Schema has created a standard in website coding which enables developers to provide additional information to search engines under the form of code. This information includes snippets such as reviews, pricing etc. Schema is actually a joint initiative made by Google, Yahoo and Microsoft. These titans have teamed up to create vocabulary that is supported on all engines. The vocabulary is extremely deep, so you should check out the full list here. Simply including the Schema markup in your website won’t make it rank higher on SERPs. (although Kissmetrics considers that websites with the markup rank better than companies without it). A recent study has actually shown that websites with Schema rang an average of 4 positions higher in SERPs. Nevertheless, we can’t be 100% sure if the markup influences rankings (Matt Cutts has neither affirmed nor declined this). What we do know is that rich snippets greatly increase the chance of attracting visitors. According to Search Engine Land, rich snippets can increase SERP click through rates by 30%. This means that you will receive 30% organic traffic for your eCommerce store. There are many elements which can be used on a website, but we would like to focus on the ones which would greatly benefit eCommerce websites. The basic elements of the Schema micro-data are fairly simple to implement with specific tags and codes (example itemprop=”reviews” can be included on the review section of the website). More complicated elements, which also include detailed information have tags like “worstrating”, “ratingvalue” etc. The first rule with Schema.org is that it needn’t be implemented on absolutely every page that you own. It is more than enough if you add it to the pages that actually matter (landing pages, pages that already receive traffic, product pages, popular products etc). But how exactly can you add the Schema markup? As an eCommerce expert you are probably already familiar with the basic elements of the HTML language. Search engines rely on HTML information, and crawlers need it in order to correctly index your information. Micro-data works almost in the same way: it consists of a set of tags that makes content easier to understand by crawlers. The <div> tags act as containers for the information you want displayed. Itemscope refers to the code and information in the div dag, and it explains specific items. 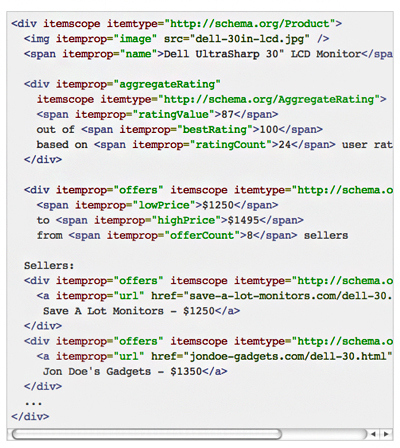 Properties can be added to a specific item by using the <itemprop> tag (it also works with headings and paragraphs). Finally, the <itemtype> tag explains the type of item being marked. 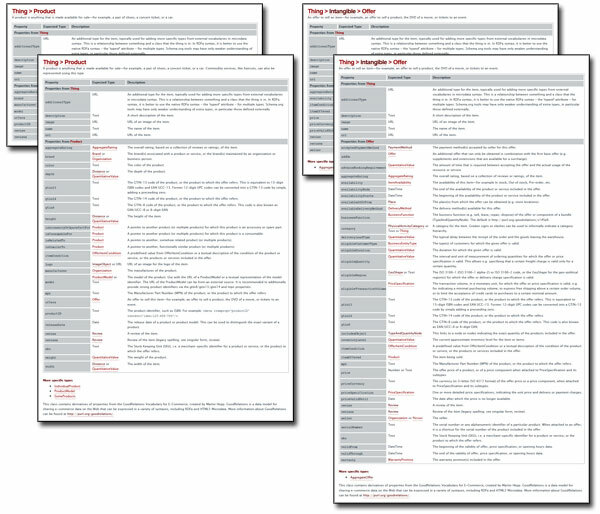 GoodRelations and Schema.org are both vocabularies, and the vast majority of GoodRelations elements have been included in Schema.org. This means that a multitude of new properties are available for eCommerce websites. As a matter of fact, the number of product specific properties has grown from 8 to a staggering 25 + an additional three product-specific types. With these elements it is now possible to describe the physical properties of a product, its number of product identifiers and many more. Let’s take a look at several elements. 2. Product Numbers: You can either use the old ProductID tag, or you can go for the more specific gtin13, gtin14, mpn, sku and gtin8 tags. 3. Product Relationships: tags such as is AccessoryorSparePartFor, isConsumableFor, isRelatedto, isSimilarTo, have been added to make product linking easier. For example, you can now show which camera lens fits with a certain camera or what type of battery you need for your phone. This was impossible in the past. 4. Specific Product Types: makes it possible for very specific items (example: a phone with a serial number) and general products (similar phones) to be described via the IndividualProduct, ProductModel and SomeProducts tags. As if these tags were not great enough already, Offer-specific properties have also grown from 10 to an incredible 37. While the tags above are used to categorize and describe products, the following coding elements will help you provide additional information about offer conditions, warranties, availability, prices etc. Let’s take look at the most important offer-specific elements. 1. Offer Availability: Costumers probably want to know if a product is still available before they click on the website. With the availabilityEnds, availabilityStarts, availabilityAtorFrom, availableDeliviryMethod you can display the length of time when an offer is available, how it can be obtained, and what delivery method clients can opt for. 2. Offer Warranties: Warranty information is also essential for eCommerce websites. It can now be included in the rich snippet with the The property warranty and its expected type and WarrantyPromise tags. 4. Offer Business Function: Last but not least we have the BusinessFunction tag. With this mark-up you can display things like car leases, apartment rentals, maintenance agreements and many more. These were only a few examples of the new elements resulted from the GoodRelations integration. Retailers and eCommerce site owners are advised to thoroughly examine the Offer and Product classes to understand which tags will best suit their needs. Two more tags that you would do well to remember are OwnershipInfo (which describes the ownership history of a product) and OpeningHoursSpecification. The list of structured data elements doesn’t stop here. Let’s take a look at some more elements that can greatly benefit your business, depending on its niche. Reviews are essential for eCommerce websites, as they reflect the opinions of your customers (statistics show that most prospects check out customer reviews before making a purchase). 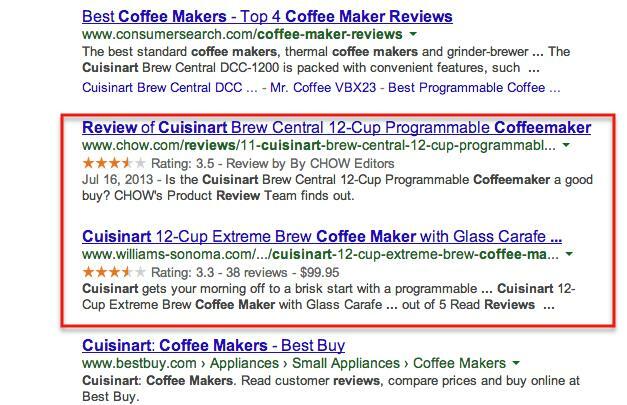 Review Schema Markups, which include the URL to the product, the review and user comments can be added to Restaurants and eCommerce websites to increase click-through-rate. That is because consumer reviews are nearly 12 times more trusted than product descriptions made by retailers and manufacturers. In addition to this, the review mark-up goes beyond eCommerce and Restaurant websites. It can also be added to entertainment, events and music/movie websites. It is already common knowledge that local listings have a huge impact on the SEO of eCommerce websites. Every eCommerce site should utilize local SEO to full extent. Schema.org can help with it. You can add the address and contact information of your business with the markup. This information can be added to the footer, sidebar or contact page. If your goal is to rank better, look better on SERPs and attract more people, Schema.org can definitely help you. Here are a few simple steps that will help you get started. 2. Choose the Type of Data that you wish to Markup. In this case, you will either choose local business or products. On the bottom of the page you can paste the URL of the page or article, or you can paste the HTML code instead. Click Start Tagging. The tool will now load your data and create the workspace for your markup phase. 4. 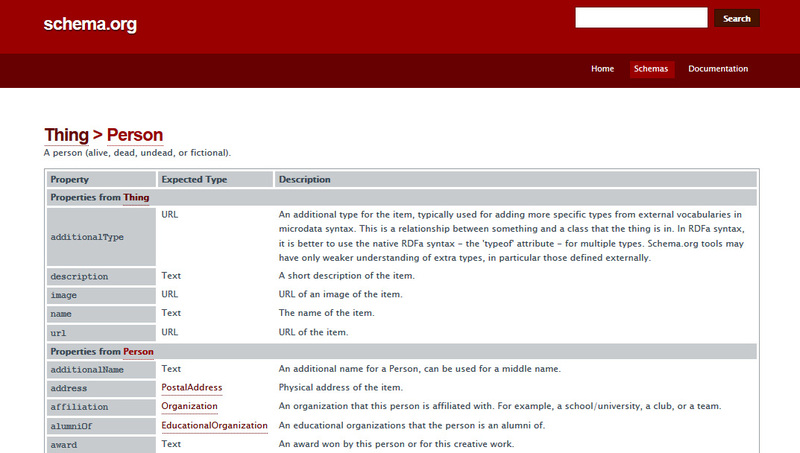 You can now see the page you have inserted on the left, and your structured data items on the right. From here on out everything is extremely simple. Highlight & select the elements you wish to mark-up. Once you are done selecting, give an attribute to your element. (for this purpose we have selected a random article from www.lifehack.org). 5. Add markup items that you consider relevant to your business. You won’t be able to tag everything, but use what you can. 6. Once you are done, it is time to click CREATE HTML. What happens now is that the tool will create a HTML page with essential micro-data that you have inserted. 7. 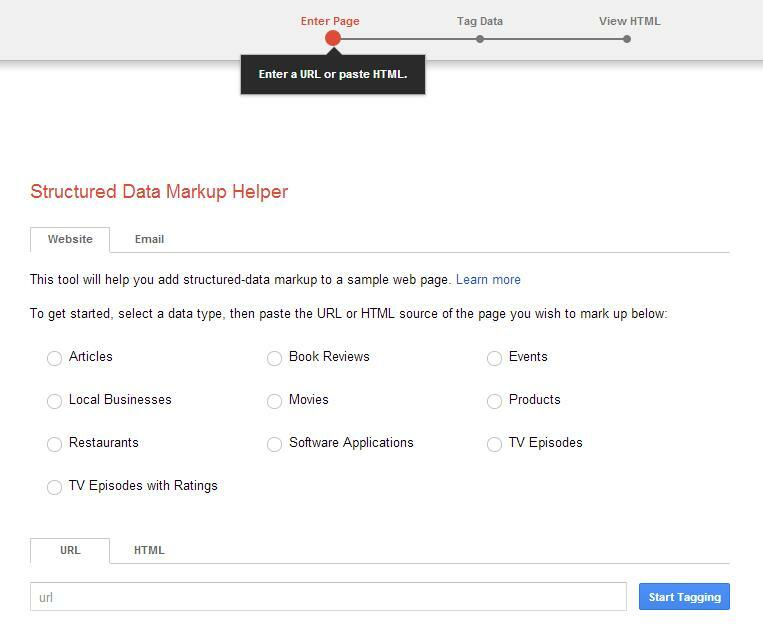 The final step is to add the schema markup to your page. Go into CMS or source code and insert the highlighted snippets in the correct spots. Once you are finished with this you will be presented with a series of “next steps”. 8. All you have to do now is check to see if your Schema.org Markup is working. You can use the Structured Data Testing Tool for this purpose. Insert the URL or HTML code and click preview. Edit anything that doesn’t work. These tips are only some of the easiest ones. As you may already see, the world of Schema.org is huge. You should definitely visit the Organization of Schemas and check out the entire list. There is no rule for useful schemas. Anything that you think might help your business is welcome. There is also a master list available at The Type Hierarchy. All in all, the more content and pages you markup, the better. Keep in mind that only 0.3% of sites are taking advantage of this feature at the moment and this means more chances to increase your visibility on SERPs. 10 Response to "How to Use Schema.org for eCommerce Websites"
I never really knew that this schema coiuld help with my search engine rankings. There are really so many things out here today that you can do. I guess you just have to be in the know. When creating a schema, if you have an Ecommerce site it is very important to include specific product details like item numbers, price and description. The biggest thing I see with utilizing this schema is that I can include product rating info. If people can quickly see that I have a 5-star rating right in the search result listing, that makes my listing so much more attractive and increases my click-through rates. 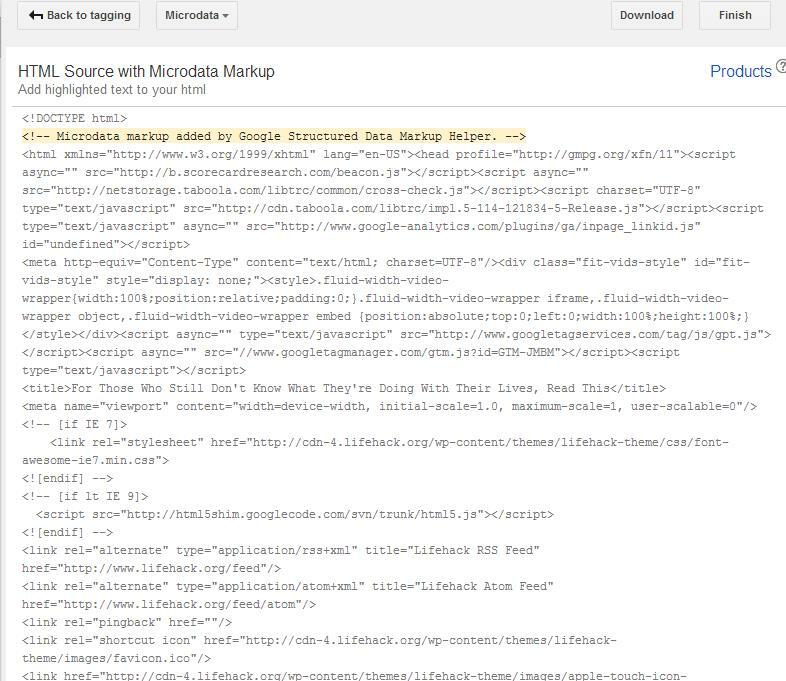 The structured data testing tool is a great way to review your updates so you can see if there are any errors. The last thing I want is a messed up listing. The ability for me to include specific product information into my listings is very powerful. This detailed information allows my customers to make a more informed decision when purchasing. Not only does the Schema help me with my search engine optimization, but it also helps potential customers when they look at the listing results. It gives them more useful information before they even click on a link. With all the tools that are available for creating Schemas, you really don’t need to know how to write the code. These helpful tools will generate the code for you.